Amid fanfare fit for actual world-class athletes, five Americans with really fast fingers took home the gold medal in the popular "Counter Strike" competition of the World Cyber Games championships, capping five days of intense gaming by the world's elite. Team3D defeated the Titans of Denmark on Sunday in the counterterrorism-themed PC game, where operatives stake out ramshackle buildings with high-powered sniper rifles and other weapons to take out their foes. Team3D consists of Salvatore Garozzo, Johnny Quach, Dave Geffon, Ronald Kim and Kyle Miller. The squad also took home $50,000 for their video game prowess. If they plan to pop a bottle of celebratory champagne, only Geffon is old enough to take a legal sip, as his teammates are all under 21. Many players of online PC games know each other only through nicknames, e-mails and game contests where they never actually meet. This contest allowed gamers to compete in person. "It really is a great opportunity to meet people from across the world," Geffon said after grabbing the gold. 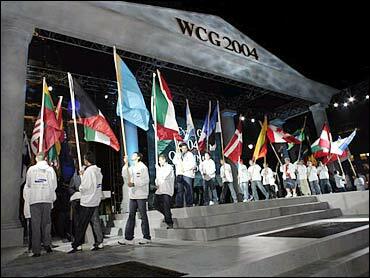 Organizers said about 30,000 people attended the World Cyber Games championships and outdoor festivities over five days. The event's organizers said the final match was watched by an enthusiastic crowd, affirming what others in Europe and Asia have known for years: Top-tier video game playing can become a viable spectator sport when the stakes are high. Winners at this year's event, which took over the streets near San Francisco City Hall, took home a combined $400,000, according to organizers. The video game industry rakes in $10 billion annually in the United States alone. This was the first time in its four-year history that the World Cyber Games has been held outside of South Korea. The event is primarily the brainchild of marketing whiz Hank Jeong, backed by the financial muscle of Samsung. In addition to "Counter Strike: Condition Zero" and "WarCraft III: Frozen Throne," players competed in "FIFA Soccer 2004," "Need For Speed: Underground," "StarCraft: Brood War," Unreal Tournament: 2004," "Halo" and "Project Gotham Racing 2." All of the games were played on PCs, except "Halo" and "Project Gotham Racing 2," which were played on Microsoft's Xbox.